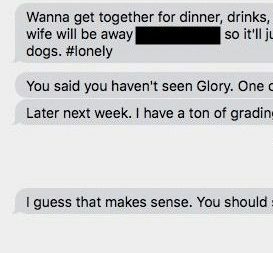 A former student says a Tarleton State University professor invited her to “dinner, drinks & movies” while his wife was not at home last spring. 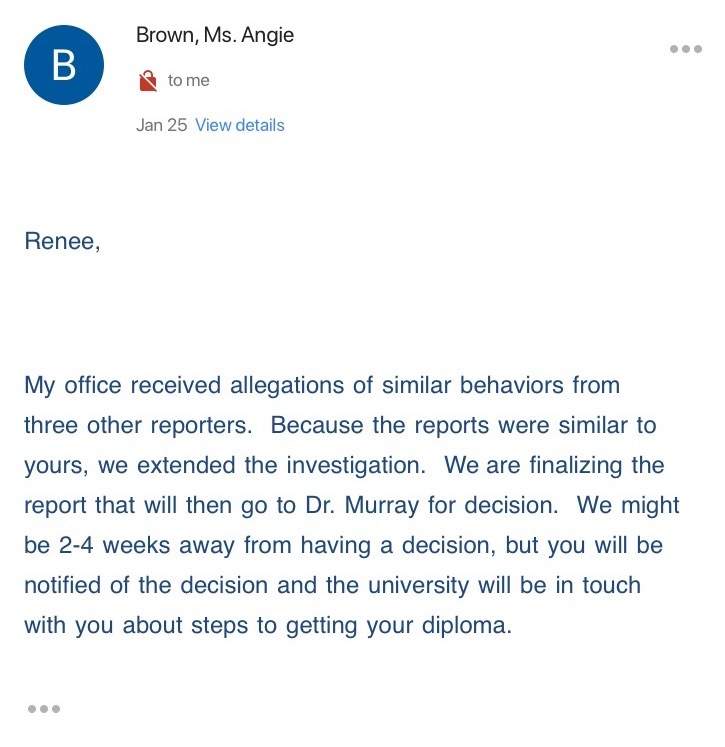 The student, Renee Warner, says she filed complaints about Dr. Michael Landis’ conduct with the university and was told that three others had complained about him as well. “Wanna get together for dinner, drinks & movies? My wife will be away…so it’ll just me & the dogs. #lonely”. This is a screenshot of the text message from Landis that Warner provided Texan News. Photo by Quanecia Fraser. 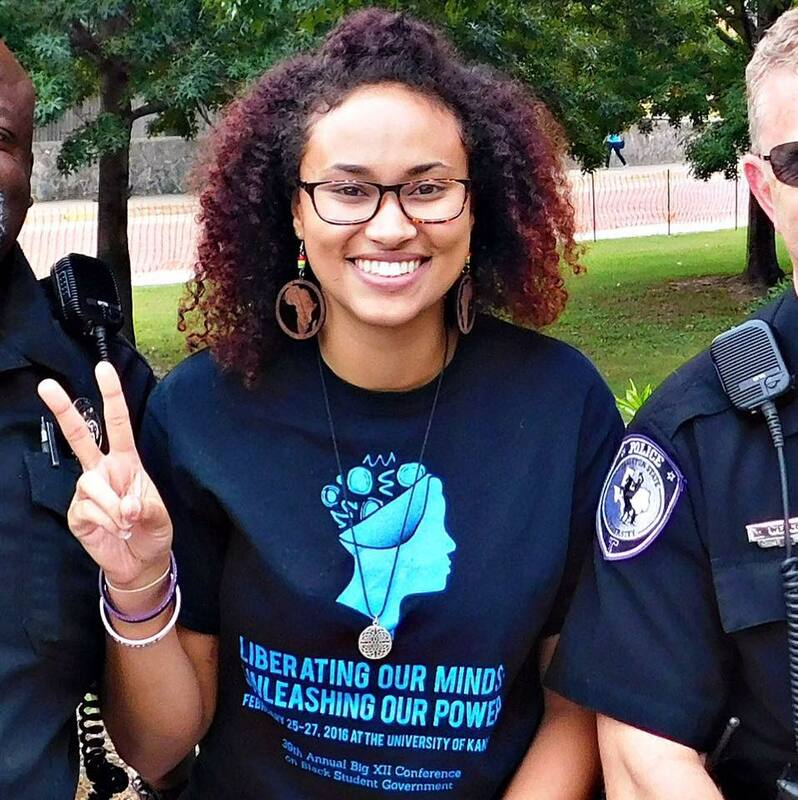 Warner, who now lives in Killeen and works for a call center, said she filed complaints about Landis with the university Title IX office and Employee Services, formerly known as Human Resources. 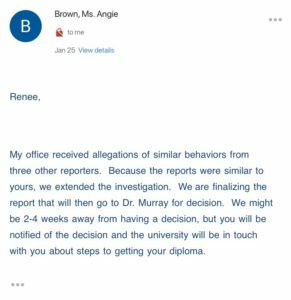 Warner shared a Jan. 25, 2018 email with Texan News from Employee Services Assistant Vice President Angela Brown. “My office received allegations of similar behaviors from three other reporters. Because the reports were similar to yours, we extended the investigation,” Brown wrote. “We are finalizing the report that will then go to Dr. (Karen) Murray for decision. We might be 2-4 weeks away from having a decision, but you will be notified of the decision and the university will be touch with you about steps to getting your diploma.” Murray is the university Provost and Executive Vice President for Academic Affairs. Warner left the university at the end of the Spring 2017 semester, before being able to graduate. Warner said she failed a class with Landis after she stopped attending because she felt uncomfortable with his behavior. There is also some mystery surrounding Landis’ status with the university. His name is still on the door of his office in the O.A. Grant Humanities Building. However, Texan News checked Tarleton’s “myGateway” system and Landis was not listed as a professor for any of the Spring 2018 classes. He’s also not listed as a professor for any of the Fall 2018 classes. 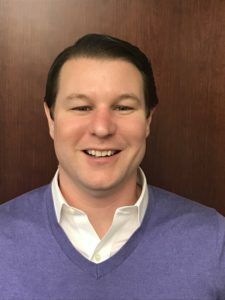 Texan News made repeated attempts to get Landis’ side of this story— by emailing him, calling his office number and calling his personal phone number before finally knocking on his door at his home in Granbury and leaving a letter requesting an interview. “I am eager to speak with you and answer all your questions. However, I am not permitted to do so at this time,” Landis wrote in a Feb. 12 email. In a subsequent email, he referred questions to his department head, Dr. Eric Morrow. Morrow declined to discuss Landis’ situation as did Provost Karen Murray and College of Liberal and Fine Arts Dean Kelli Styron. “I am not available for such an interview at this point in time.,” wrote Murray in a Jan. 31 email to Texan News. Texan News spoke to Warner via Google Hangouts video. Photo courtesy of Warner’s Facebook. Texan News interviewed Warner on Feb. 2 via Google Hangouts. She said that the text message from Landis stunned her. Dr. Michael Landis. Photo by Texan News. Warner said she started to feel increasingly uncomfortable, to the point that she stopped going to Landis’ class. 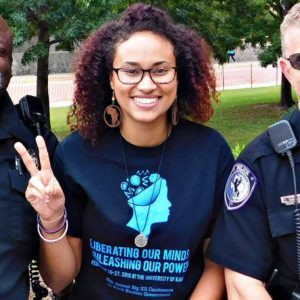 I honestly was at the point where I just wanted to get my degree and just graduate and just leave Tarleton for good,” she said. “I still feel betrayed today. But, one thing that I’ll never forget and I’ll always thank Dr. Landis for is that he encouraged me to be a whistleblower, to call out people’s doing wrong. And, I really hope he understands why I’m coming forward and I’m using that very same tactic that he taught me—being a whistleblower,” said Warner. Texan News filed a public records request for Landis’ personnel files. The university released 113 pages of his personnel file. Nothing in the file, however, mentions Warner or the investigation. Warner says she also requested records for the reports she filed against Landis, but that the university asked the Texas Attorney General for permission to withhold them. « Older Article Opinion: Is Haiti a s***hole?